These are special materials to help fiddlers, other lead players, and backup players add tunes to their repertoire. These releases presently are available only directly from Voyager since production runs are limited. Unless otherwise noted, all Repertoire Builder Series releases consist of a CD of the tunes in a sleeve, music for the tunes professionally set in standard music notation, and chord charts for accompaniment, all punched for a standard 3-ring binder, packaged in a plastic ziplock bag. Unless otherwise noted, all Repertoire Builder packets are $15.00. 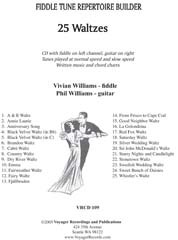 CD with fiddle on left channel and guitar on right channel. The 25 tunes are each played at normal speed, and comprise the first 25 tracks of the CD. 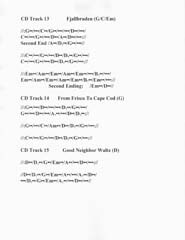 The next 25 CD tracks (total of 50 tracks on the CD) are of the fiddle only playing once through the tune, slowed down electronically in the computer to enable ear learners to pick up the tune more easily. 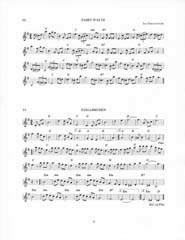 Music in standard musical notation and chord charts for each tune are included in the packet, along with some tunes histories, suggestions for how to use the tunes for dancing, and tips on playing the tune effectively, when appropriate. Each normal speed CD track is started with an in-time count-in to begin the tune.